For the discussion presented here, please refer to the Glossary in order to become familiar with the terms that are used throughout this topic. The diagram below left shows how the 7 chakras can be viewed as a representation of the rippling effect caused by the drop of divine nectar emerging into 4D Space. The drop descends through the central channel and enters the pool of love in the 4th chakra, represented by the interpenetration of the Heart and the Spade in the center of the diagram. The diagonal that goes through the center of the diagram represents the line dividing Heaven and Earth: as Above, so Below. The upright that goes through the center of the emblems further divides this into 4 quadrants. The emblems located above the diagonal in the diagram are spiritual in nature and are representative of the kingdom of Heaven, whereas those emblems located below the diagonal signify the realm of Earth. The diagram below right represents how we connect to each other via the diagonal that which separates Heaven and Earth. Each of the three images in the diagram represents an individual human being, in which an etheric connection is established between one-and-all as if we were all holding hands. These diagrams are largely symbolic and are meant to be taken pictorially rather than literally. Actually, the 7-chakra diagram on the left is better described as an auric field, our Aura, which emanates out as a sphere. In addition, these diagonals do not dissect our Aura in one plane only, but rather in all directions - creating the opportunity to touch any point in the outer auric sphere. In essence, this creates a one-to-all relationship, giving us as humans a direct connection to each other. Saturn rules the spades from the standpoint of karmic history, including the debt owed and the opportunity available due to the effort applied. Uranus rules spades as representative of the universal creative spark, the force that manifests the substance of the physical realm. 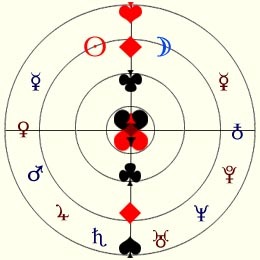 Vulcan rules the Evolved Spade with his mythical partner Venus, indicating the necessity for relationships, and the effort required to bring the vibration of honesty into our personal interactions. Uranus rules the Evolved Spade with his partner Gaia, indicating the raw sensual nature at the root of humanity--and the vibration of unconditional love that permeates the human family. Jupiter rules diamonds from the standpoint of personal authority, and represents our opportunity to create the moment based on how we feel it should be. Equally though, Jupiter exposes the opportunity, and need, to 'seek creator' in order to discover the proper use of our creative ability. Neptune rules diamonds from the standpoint of the subconscious mind, and suggests that mastery will be attained through identification with our dark, shadow aspects,thereby merging with the depths of our psyche. The Sun and Moon rule diamonds from the standpoint of light, representing the invisible force that governs all inner and outer activity. Essentially all of physicality is a manifestation of the light penetrating the 3rd Eye, though it reflects into physicality such that it creates the 3D illusion that we are all familiar with. Mars rules clubs from the standpoint of the impulsive, aggressive concrete mind (symbolically asleep); while Athena rules clubs from the standpoint of the intelligent, resourceful rational mind (symbolically awake). Pluto rules clubs from the standpoint of the abstract mind, and offers us the opportunity to view our current created seed through the effort of releasing judgment and atoning for transgression. This is accomplished largely through the faculty of the abstract, lucid mind where we are given access to view our current life history. However, in order to see a preview of the life review it is necessary to sit in the seat of Pluto, thus the need to release the judgment and offer absolution. Mercury rules clubs from the standpoint of the Soul Voice, a reflection of the higher mind when operating properly. As messenger of the gods, Mercury plays the role of contacting the light of the 3rd Eye. When contacting the Sun aspect (radiant light), it exposes our connection to heaven. When contacting the Moon aspect (reflected light), it exposes our shadow self, a reflection of our connection to Pluto, god of the underworld. Gaia (Earth) rules hearts as the dominant paradigm for humanity, being that it represents contact with our pure potential in direct reflection of our divinity as Children of the God/Goddess. This connection represents identification with the Cherub, the voice of the conscience. Venus rules hearts as the radiant beauty that emanates from our being as a function of the unconditional love that we are in alignment with, and resonate. The Spirit force behind creation operates through the interaction of the dual forces of attraction: 'like attracts like', and 'opposites attract'. Though attraction permeates all space, it is especially recognized in the 4th chakra where the 'water of life' fountains, forming the pool of love in the Heart. In the evolution or unfoldment of the cards, the suit of Hearts comes first, followed by Clubs, Diamonds and Spades. This evolution is not linear, but rather a spiral signified by the rebirth stage of the Spade. The circle that contains the 4th chakra represents the number zero. Zero is always present but only significant when an event occurs that fills its space. In the 4th chakra, the Heart suit appears as the drop of divine nectar enters the pool of love. At the birth event, the Heart is created (1) which brings with it the veil (2) creating the dualistic counterpart the evolved spade (3). In addition, as the Heart and the evolved spade crisscross at the firmament the interpenetration of time and space (4) is cognized (as One is to Two, Two is to Four...see Numerology). The interpenetrating of the Heart and the Spade is significant for a number of reasons. The diagram below is broken into 3 parts, and presents a very simplistic symbolic picture of the evolution of number and of the suits. 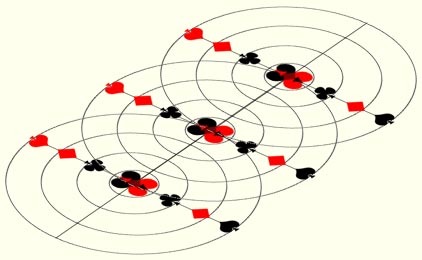 In the 1st image, the red circle with black dot (drop of divine nectar) appears (1), while simultaneously the diagonal (2) emerges - dividing the space equally. This reveals the black circle with red dot (the karmic drop of physicality - 3, the created one). The red circle (Heaven) above the diagonal (the veil) with the black circle below (Earth) signifies the realm of all possibility (4). Taken as a whole, this image resembles the lemniscate in its upright position. The lemniscate is a mathematical symbol for infinity, which resembles a figure-eight on it’s side. The 2nd image represents movement within infinity. The drop of divine nectar, Heaven, crosses the firmament, but its central point stays attached to the diagonal. At the same time, the karmic drop is magnetically drawn up through the diagonal both equal and opposite to its heavenly counterpart. Again, this image has embedded within it the number eight, but this time rotated 90 degrees - resembling the lemniscate. The 3rd image shows that the Drops continue their movement until they reach the fullness of the space. The representation of the Heart appearing upside-down in this image is reflective of the phenomena similar to what happens in our eyes (as well as our 3rd Eye). The rays are refracted and focused by the lens onto the retina causing the image to appear upside-down. The Heart represents our emergence into physical reality, where as the evolved spade represents the perfected response to all choice, called here The Cherub. The Cherub represents a place within each of us that knows the difference between right action and wrong action - and can be contacted at any moment. Since each individual will have their own unique contract with Creator, the concept of right action and wrong action will be unique to each. Thus, the Cherub represents the ultimate honesty and supercedes any written document. The journey of the Heart is to pass through all of the phases of evolution, aligning with the suit represented at each chakra level. When the Heart aligns with the Spade in the 1st chakra--balanced with the 7th chakra--a circuit is complete which connects the archetypal Shiva (Heaven) with his mate Shakti (Earth). The union of Shiva and Shakti in the body manifests divine bliss, exposing the intimate connection with Creator. The Ego represents the physical plane manifestation of the Self, essentially the lower self, which is everything below the veil dividing the 4th dimension. The Cherub then represents our presence above the veil (our Position within Spirit) and can be seen as the voice of the higher self. Ultimately, the Ego arrives with the emergence of the Heart along with the Cherub. This represents our evolution through all of our Past Lives. Before the drop of divine nectar enters and manifests the Heart, the Cherub has already chosen the environmental factors that will shape the current incarnation. This original choice is the structure through which the Cherub interacts with the current incarnation, where all following choices will be made from the point of Ego. When the individual choice of Ego aligns with the original choice to emerge, the mental faculties are activated such that movement through 3D space will reveal a language that exposes the original choice in the moment. If, on the other hand the Ego evolves without consciously agreeing to the original choice, any number of distortions will be added to the purity of the Spirit provided to that Soul (Cherub + Ego). The Ego consciousness in the moment appears in a reverse direction to the emanation of the drop of divine nectar in the Heart. Instinctual response (1st chakra) to the moment is followed by an Emotional response (2nd chakra), then followed by an Intellectual Response (3rd chakra) and culminating with an Intuitive Response (4th chakra). At any point in the process, overactivity or underactivity in a chakra can block the movement of the individual consciousness, thereby minimizing cognition of the original choice. Over time, habitual patterned responses can develop, and in the long run can play out as a block to our Highest Purpose (Pure Potential). But when the Ego has started to listen to the higher aspirations, the patterned responses will have less influence and the intuitive guidance can then be seen to appear in the individual consciousness. 4 - The 4th Dimension is the meeting place of Heaven and Earth, and represents the human kingdom. The significant factor here is that of individual choice. The Veil creates the opportunity for the choice between good and evil, right and wrong, etc., but this opportunity is revealed as a factor of the interaction of the individual intention, individual desire and individual will. An objective assessment of the choice can be made by identifying with these forces, thereby revealing the language of Cherub through the function of honesty. When the attitude is adjusted such that karmic patterns are exposed to the Ego, the individual intention is revealed through that honesty. In this way a feedback mechanism is created such that the individual intention can then be adjusted towards the higher intention of universal or unconditional love (when operating through the rising spread). When the individual desire is aligned towards 'seeking the highest', then the Ego discovers the higher desire through the feeling that pushes forth that effort. When the individual will is raised such that decisions are made from the 4th chakra perspective, then the Ego gains contact with the higher mind. The facility discussed here involves the active participation of the Ego, having the Will to go beyond the personal inclinations of the lower self in order to partake in its 4th dimension opportunity. In this, the Ego learns the language of intuition, and as a function of this learning develops the faculty of discernment. It is important to note however, that the discussion here represents the purified state of the Ego, being the voice piece of Cherub. The typical location for Ego awareness tends to be the 3rd dimension awareness, and thus is aligned with the lower mind. As the lower mind is greatly influenced by the lower intention, the task for Ego typically involves the raising of consciousness of the lower self to that of the higher self through the adjustment of attitude. 3 - The 3rd Dimension signifies the opportunity for movement or activity, and represents our contact with the animal kingdom. The intellectual response to the moment brings with it the concept of judgment, where we learn to associate the difference between right and wrong. These associations are mental in nature, and may not accurately reflect the honesty of our (4th chakra) Cherub. The 3rd chakra provides a location where the Ego responds to the moment as a function of the individual intention. The individual intention represents the physical manifestation of the yang channel of the secondary chakras which run up the back of the body. - The 5th Dimension signifies the spiritual counterpart to the 3rd chakra, and represents our contact with the community of angels. Outwardly it houses the Throat chakra, which provides the opportunity to Create the moment through use of the spoken word. As counterpart to the 3rd chakra, the 5th chakra provides the location for the original intention to operate through the body. When the lower mind learns the language of intuition--through the abstract mind--then the voice of the Soul communicates with the Ego as a function of the higher desire. In this case, the lower mind receives information via the higher mind as it circulates the energy between the 3rd and 5th chakras. This circulation raises the kundalini through the central channel, thereby creating a connection for the individual intention to Speak through the original intention counterpart in the Throat. This circulation is facilitated by the process of listening. 2 - The 2nd Dimension provides the arena for growth, and is represented by the plant kingdom. Our emotional response to the moment is a factor of our lower desire as it is conditioned by the lower intention. This Intention has its roots in the 1st chakra, but has a significant impact on our lower desire. Due to this, it becomes paramount to address the issue of Intention in order to affect the lower desire significantly. The lower desire represents the physical manifestation of the yin channel of the secondary chakras which run down the front of the body. - The 6th Dimension signifies the spiritual counterpart to the 2nd chakra, and represents our contact with the community of arch-angels. Outwardly it represents the eyes, but spiritually the 3rd Eye - which directs and focuses the 3 rays of Divine Light onto the Brow chakra (located in the central channel). The Brow chakra thus acts in a way similar to the retina of our eyes. As counterpart to the 2nd chakra, the 6th chakra provides the location for the original desire to be made visible. When the lower desire is aligned with the original desire, it allows the 3rd eye to properly outpicture the divine plan for our incarnation as a function of the higher mind. When this happens, a connection between our sexual energy (2nd chakra) and our original desire to incarnate (6th chakra) is manifest, allowing the circulation of energy to raise the kundalini further up the central channel. The liberation of our sexual energy frees us up to purify our Intention even further, thus clarifying the divine plan (or Path) more fully. 1 - The 1st Dimension provides the raw materials available to our incarnation, and symbolizes contact with the mineral kingdom. Based on our birth contract, we are provided the environmental factors of Life as a magnetic response to our evolutionary needs. The pool of karma from which we emerge is full of the life lessons which affect our lives so integrally. The way in which these environmental factors affect us is intimately tied to our response to the moment. The instinctual response offered through the 1st chakra is directly related to habitual patterned responses collected throughout our Soul Evolution. In addition, the Seed of our intention is planted here by the Cherub just as the birth contract is sealed (Solomon's Seal). Attitude management is a key factor for the 1st chakra opportunity, the hope being that the individual will grows stronger as the Ego journeys through the 2nd chakra, raised up by the wisdom of the 3rd chakra to the awaiting Heart. When the lower will is aligned with the original will, the presence of Shakti in the Body becomes completely uninhibited, thereby calling forth her spiritual mate, Shiva. The presence of Shiva and Shakti in the body unveils the reality of infinite bliss and unconditional love. - The 7th Dimension signifies the spiritual counterpart to the 1st chakra, and symbolizes our contact with Creator (thus revealing the transcendental nature of the 7th chakra). Divine Light first enters the Crown chakra and is split into 3 primary rays of light as it interpenetrates a crystalline structure in the central brain. These 3 rays are then directed to the 3 secondary chakras of the forehead, being adjusted and focused onto the central Brow chakra. The Brow acts like a retina of sorts for this universal energy (exposed as the dance of shiva), while equally providing the location where the dance of life plays out. As the Divine Light interpenetrates the central brain, the Pineal gland is activated within which is condensed the drop of divine nectar, essentially nourishing the Souls existence. Within this drop of divine nectar is imprinted the dance of shiva, or the Purpose of that Soul incarnation. As the Drop condenses in the Pineal, the Eye of Shiva opens to view the holographic imprint on the Brow through the focusing of the 3 primary rays. As the dance of life aligns with the imprint in the Brow, a signal is sent to Shakti which indicates the difference between these two manifestations. Shakti draws together the life lessons through Saturn (1st chakra), in order to bring these 2 vibrations into harmony. Equally though, a signal is sent to Shiva which indicates the congruence between these two manifestations, and in this the Eye widens to expose the universal consciousness resident in this union.